The United Kingdom will soon be the home of the world’s largest offshore wind farm. Construction has begun on the 407 sq. kilometer (157 sq. miles) project, with power company Ørsted leading development. The company explains the 1.2 gigawatt (GW) wind farm is being constructed 120km (74.5 miles) off the Yorkshire coast and is expected to be completed by 2020. Upon completion, it will be capable of supplying clean energy to over 1 million homes. Officially called Hornsea Project One, the first of the farm’s 174 monopiles has already been installed. Monopiles are cylindrical support structures made of steel that are installed deep within the seabed. 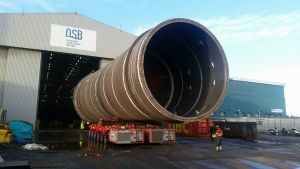 They’re the most commonly used foundations in offshore wind farm projects, and each monopile used for Hornsea Project One is 65m (213 ft) long, weighs around 800 tons, and has a diameter of 8.1m (26.5 ft). Construction is being carried out by two ships. The first, the Jack-Up Vessel Innovation, is handling the aforementioned monopiles — of which it can carry up to four at a time. The second ship — A2Sea’s vessel Sea Installer — will join the project in March, installing the 7 megawatt (MW), 190m (623 ft) tall wind turbines and turbine blades. It can carry four turbines at a time. According to Electrek, these turbines could potentially generate 25 hours of electricity with one blade rotation. Once Hornsea Project One is completed, Ørsted has plans for additional wind farms. The appropriately named Hornsea Project Two will follow soon after the first and is expected to power up to 1.6 million homes. 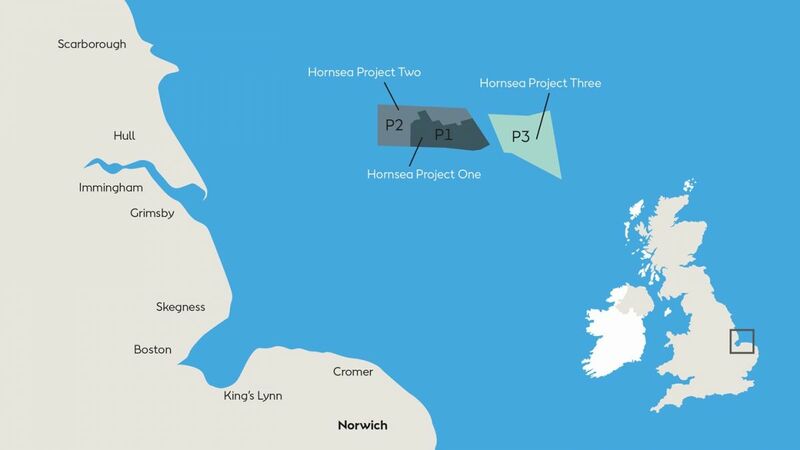 Hornsea Project Three, while still in early development, will be constructed near the preceding two wind farms. “These wind farms will not only greatly contribute to the UK’s goal of decarbonizing our energy system, they are also bringing jobs and investment to Grimsby and the North East,” said Duncan Clark, program director for the project, in a press release. Currently, the title of world’s largest wind farm belongs to the London Array. The 630 MW wind farm is 100 sq. kilometers (38 sq. miles) in size, and powers roughly 500,000 homes in the UK. Germany is home to the world’s largest wind turbine, however, which towers over the German town of Gaildorf at an impressive 808 ft tall. It’ll be interesting to see if wind farms continue to grow in size as wind energy becomes more viable. Last year, scientists at the Carnegie Institution for Science in Stanford, California suggested that a single giant wind farm built in the North Atlantic could capture enough energy to power the entire planet. While it’s an interesting idea, it would bring its own set of problems — such as dealing with extreme mid-ocean weather, reducing the performance of onshore wind farms in the UK, and reducing temperatures in the Arctic.